My own classes – group or private here in South Florida would have been great for her, but alas she lived too far away. I realized that since so many of my contemporaries are looking to get into their creative sides and to experiment with painting, that perhaps I could help by sharing my insights. So many classes are given everywhere and for all levels, and it can get very confusing as to just where to start this new painting adventure. Being both an educator as well as professional artist – I have helped so many people to see the world with fresh eyes, those of an artist. Initially in New York City at the School of Visual Arts – then other venues in NYC, New Jersey, and South Florida. Famous master artists have shared their knowledge and secrets with me and I love to pass this down to my students. This knowledge can get lost all too easily if not shared. As a young gifted artist, I had thought magically my artwork was good. Then I lucked out and took a class with a master artist who taught me the basics of art. I can never repay Charles Werner of Fort Lee who made me really start to learn what painting was all about, and how to have control. First – Always check the art teacher’s artwork to see if you actually like it – Check websites etc. This is important as an art teacher will be showing you how to replicate his/her painting style – so make sure you like it first of all. Next, call and speak to the teacher about what will be taught, and if she works with your skill level. Also make sure she communicates well. Finally, make sure that basics are taught!!! 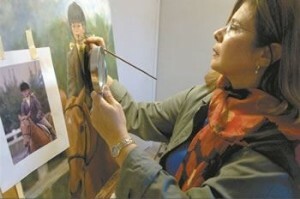 Even an experienced artist needs to go back time and time again to refresh their knowledge of the basic rules, vocabulary, and techniques of that art form. Once you have the basics – you can be your own creative self!! Many a time, I find that if I had slowed down and remembered my basics, I wouldn’t have had to redo a section of my painting. You may have a wonderful natural skill in painting, and with the right teacher you will be able to create exactly what you want. If you have any specific questions, feel free to contact me. It would be my pleasure to help you find your creative path.